• Bumped to Beta since it's been proven stable enough. • Editor was replaced by the Console (see the about section for more information). • Zgoo was replaced by Mer Torchbug. • UI has received additional polish. • Added a bunch of missing textures to the Library. • The Library now only displays up to 1000 rows. • Removed extension from RobotoMono-License.txt to avoid false add-on detection. • Library for items, quests, achievements, etc. • Visual designer for interfaces. • Overlay with Lua memory consumption and possibly other useful debug information. • Due to the game limitations the Console output is limited to 1000 characters. This is specially problematic when you're working with a table. • The Library and Explorer lists are limited to 1000 rows due to memory usage concerns. 1. NEW! Console: simple REPL (read, evaluate, print and loop) console. 2. Explorer: search the game runtime for functions, tables and whatnot. 3. Media library: search and preview textures and sounds in-game. 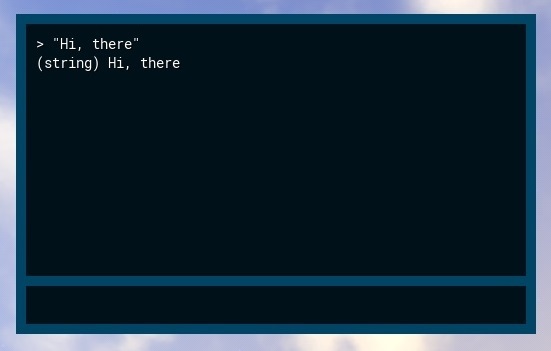 • Unconstrained chat window size. • Keybind for reloading the UI. 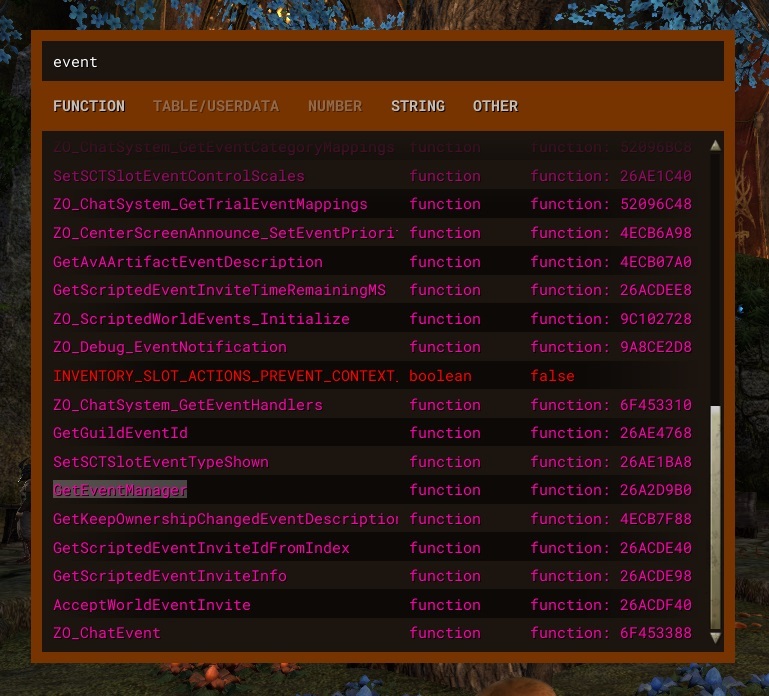 • Keybind for inspecting the control under cursor. 1. If the window is closed, show it and focus the search box. 2. If it's open but is not focused, bring to top and focus the search/input box. 3. If it's open and focused, close it. 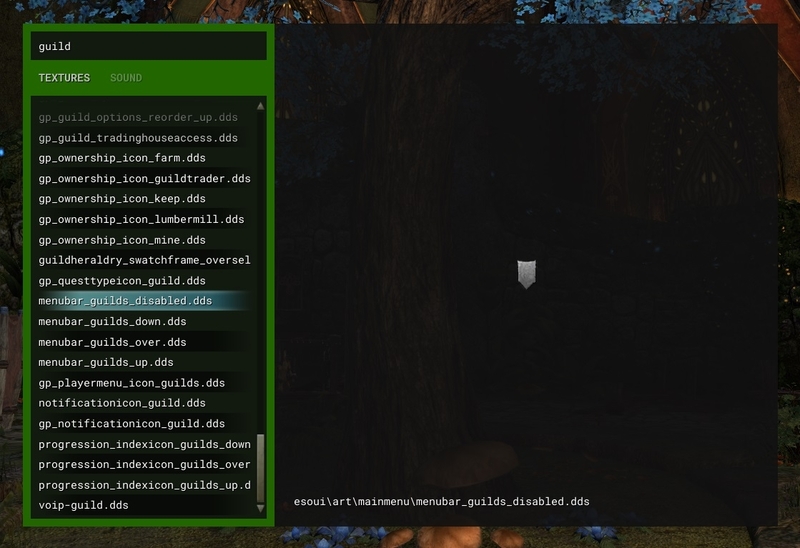 • You can use slash commands too to open/close the windows: /developersuite, /console, /explorer and /library. • NEW! You can navigate througth the Console history by pressing up and down arrows. • NEW! 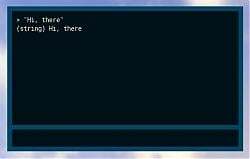 The Console has two custom commands: "clear" and "exit" plus it accepts all regular slash commands as the chat does. • NEW! You can copy contents from the Console output. • Explorer is full integrated with Mer Torchbug; you can inspect any piece of data just by clicking on its value. • From the search box in the Media Library you can use <up-arrow> and <down-arrow> to navigate the items. • You can close any window just by right-clicking on it. • Size, position, and content of all windows are saved in real time, so you can start right from where you left. • Fix font file not being loaded. • Windows start now at the center of the screen. • You can now close a window by right-clicking on it. Cool Addon and great that it uses TorchBug. Love the sound browser and mini console. There is a problem using the key bindings, because of a name change in the ESO API I guess. In Bindings.xml change the layer name from General to SI_KEYBINDINGS_CATEGORY_GENERAL and it works again. Last edited by Patros : 05/04/17 at 04:15 AM. The textures/sound window has no additional filters or does it? When I enter "nibenaymudcrab" to find the mentioned texture I get an empty list. Fixed in the last patch, sorry for the delay and thanks for the feedback! if you're not finding something either in Explorer or Media Library, you have to filter more items out. That's an awesome add-on, thanks! 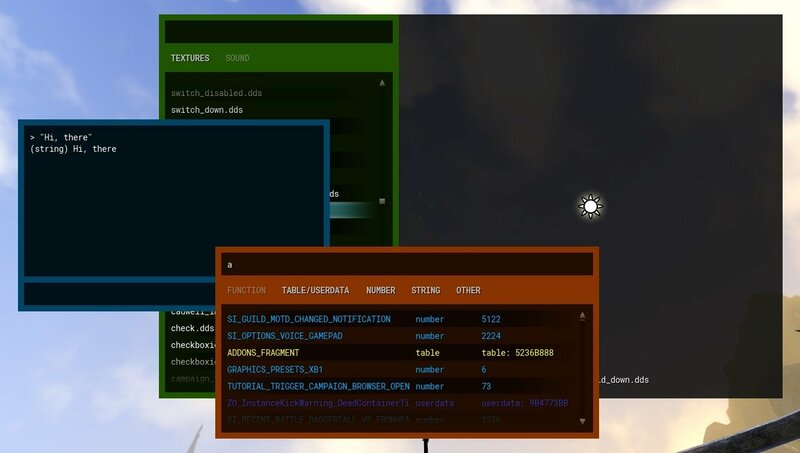 Can you please also add this to the category Utility Mods so it is available in Minion and can be updated automatically (I always forget to do it manually )? is there an item viewer? or search items by text to find their id? Thanks and sure will do! I personally extracted the game files and made a recursive list of all files inside the "esoui/art" directory so everything should be there. One thing though is that every search is limited to 1000 results because of memory consumption when rendering the scroll list. I'm going to tweak that later but currently if you're not finding something either in Explorer or Media Library, you have to filter more items out. Last edited by CaptainBlagbird : 12/08/15 at 04:21 AM. Tried it, all menus broken, empty windows, windows not moveable, no option to do anything rather than alt + f4 and disable it. A mistake, have i something forgotten? Hey man, I'm really sorry but it was my fault. I fixed the add-on name at the last time and forgot to fix the path to the font files. Really really sorry, could you give it another try? And thanks a lot for the feedback! I think that's pretty unlikely, since it would require an exhaustive list of all the items in the game, and that's a lot. Last edited by haggen : 12/06/15 at 08:40 AM. The texture search is a big help. I wrote one myself but never published. Can't imagine trying to get that stylish layout without being able to easily find the right graphics! I will be following this to see what becomes of the GUI builder which sounds really exciting to me. Might I ask if you plan to design it with XML generation in mind (preferred), or if it will be purely LUA-based? Thanks for the cool tools. Thank you! ^^ The GUI designer is going to be a tough one, but yes, it'll most likely spit XML. But it'll probably be best for scaffolding and prototyping rather than production-ready code. I'm sorry to hear that. I might have some idea; go to Documents/Elder Scrolls Online/live (or liveeu) and there located and delete ShaderCache.cooked. You may want to just rename it or move it elsewhere in case anything goes wrong. Sometimes the game simply doesn't load a new font (and this add-on has its own font file). Also the windows doesn't currently have a close button. I seem to have overlooked that, so my bad. The only way to open/close the windows right now are the keybinds in Control settings. 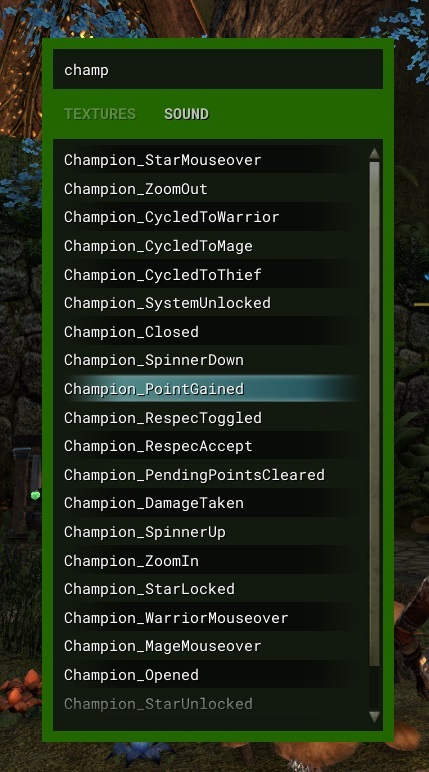 Now if it's messing with other parts of the game, try disabling other add-ons that might have conflict. Worst case scenario, try disabling every other add-on, letting only this one enabled and see how it goes. In any case I'm here to help if you need. Thank you very much, Mitsarugi! Glad to know that my work inspired or was helpful in anyway! Last edited by haggen : 12/06/15 at 07:01 AM. Last edited by @AlphaLemming : 12/06/15 at 06:05 AM.